Visit our Spring Boat Sales Open Weekend from 5th to 7th April at Fox’s Marina, Ipswich. Beneteau Oceanis 35.1 and Swift Trawler 35 demonstration models available to view and with special open weekend deals. Plus selection a selection of second-hand boats on show. The British Yachting Awards 2018 were held on Thursday 11 December in the exclusive surroundings of the Royal Thames Yacht Club in the Knightsbridge district of London. This ceremony was organized by the sailing magazines Yachts and Yachting, Sailing Today, and MUSTO, the technical clothing manufacturer. For the first time, the public were the only ones allowed to vote for their favourite boat among those nominated in the 15 different categories. 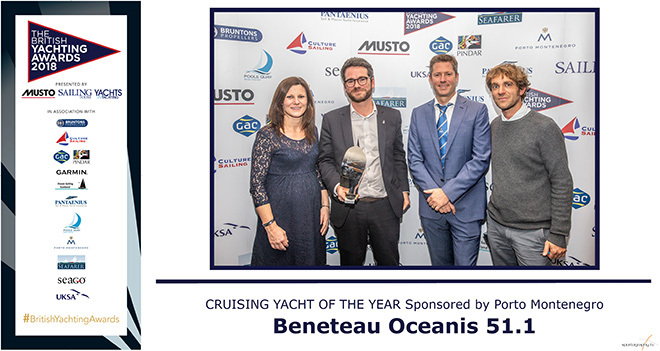 The Oceanis 51.1 won the award in the “Cruising Yacht” category, ahead of the Dufour 460 L, the Hanse 458, the Jeanneau Sun Odyssey 410 and the Southerly 480. Since it was launched in 2017, the first model of the new generation of the Oceanis range is as successful as ever internationally and the 100th Oceanis 51.1 is about to leave the factory, before being delivered to its owner in Australia. The sailing yacht will be on display at the Boot Düsseldorf show in January 2019. Jean-François Pape, Communications Manager at BENETEAU receiving the award.